He’s developed a patented liquid chromatographic mercury speciation technology that differentiates and identifies the exactly source of your mercury — whether it’s from your dental amalgams, or from eating contaminated seafood. He’s also involved in developing new lipid-based delivery systems for nutraceuticals, including liposomes and micro-emulsion systems to address the need for effective and affordable detoxification. “We had sophisticated computational tools for telling us what kind of ligands (binding molecules) are holding the mercury. What I was tasked with was developing an analytical system for separating different forms of mercury out,” he says. I actually used Shade’s diagnostic tests and detox processes about five years ago to help me detox from mercury amalgams, and was able to cut my mercury level down to normal, quite quickly. The test he developed is called the Mercury Tri-Test, because it looks at three different kinds of samples: blood, hair, and urine. You always have more mercury in your tissues than in your blood. But there’s a steady state or ratio between what’s in your blood and what’s in your tissues. “The most telling of these, the most importantly diagnostic of these ratios, is looking at the inorganic mercury in the blood compared to the inorganic mercury in the urine. “This is what we’re measuring — that movement into the urinary flow of the toxic conjugates. That area in the proximal tubules is very, very easily damaged. In mouse models, a combination of endotoxin and mercury exposure creates that damage to those transport proteins. If you have a high mercury level and a leaky gut, you’re very likely to damage the very transport system that’s getting that mercury out of your body. If you’re having joint problems or fibromyalgia-like pain, you need to work on getting rid of this inorganic mercury, and you need to make sure your kidney transporters are working well. Metylmercury is a less cytotoxic (toxic to the cells) form of mercury. If you only have methylmercury in your body, it’s all going through glutathione conjugation to your liver, and on to your GI tract. “For instance, if somebody only has methyl mercury exposure from eating fish and has no amalgams … they’re going to break down a certain amount of the methyl mercury into the inorganic mercury pool. But that’s not a fixed rate. That’s an individual reaction that we don’t really understand. I suspect it’s related to oxidative stress. But some people break down a lot and really build up this inorganic mercury pool despite not having amalgams; some people breakdown only a little bit. Seafood is essentially the sole source of methylmercury. However, it’s a major source of mercury, and it can be problematic if you eat a lot of seafood. The type of seafood you eat also plays a big role. At the top of the food chain, a shark might have 4 parts per million (ppm) to 10 ppm methylmercury in its tissues. According to Shade, swordfish is routinely 1 to 5 ppm, and tuna is routinely in the 1 to 2 ppm range. Wild salmon like Coho and sockeye can be in the 10 to 100 ppb range — a hundred-plus-fold lower level than high-level shark, tuna, and swordfish. Depending on the fish you compare, there could be a thousand-fold difference between the mercury levels. To put that into perspective, it’s like eating 1,000 pounds of anchovies versus 1 pound of shark. So if you eat fish on a regular basis, it’s really important to look for species known to be low in mercury. When you take a chelating agent, such as DMSA, you solubilize a lot of mercury in the form that needs to be filtered out through the proximal tubules. 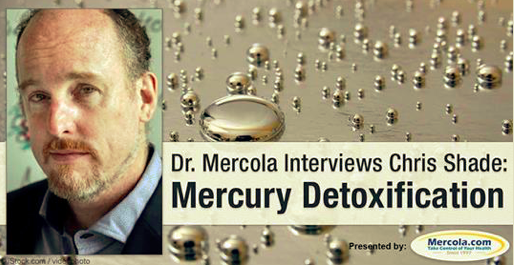 This can be a risky type of mercury detoxification and typically isn’t necessary. Nevertheless, if you choose to use it, make sure you are working with a highly skilled clinician in this area. “The central nervous system and nephrotoxicity (or kidney toxicity) are the most well-understood damages,” Shade says. “It should be said that in neurotoxicity, the most common site for damage is the N-methyl-D-aspartate (NMDA) receptor or the glutamate receptor, which causes hyperglutamate activity, which leads to anxiety. Glutamate excess or excess activity of the glutamate receptor makes a chronic peroxynitrite free radical cascade coming off of those receptors that causes neuroinflammation, which gives you brain fog and fuzzy thinking. It also causes a lot of anxiety and disrupts your autonomic nervous system function … That’s another downward spiral. Thyroid problems is also a huge one — hypothyroid activity or lack of thyroid activity. It’s mostly damaging the deiodinase, which takes the T4 and moves it to T3. If you’re looking at your thyroid labs and you have a high T4 but a low T3, mercury, cadmium, or arsenic are the most dominant players in breaking that chain. Fortunately, there are solutions to these problems, and Shade’s work has led to treatment strategies that are far safer and more effective than earlier detox methods used by many alternative practitioners, including myself and Shade. Once I cleared that metal out of the GI tract, it seemed to open up the liver’s ability to work with the small intestine, start moving that load out of there, and take the load away from the kidney. It worked so well, that provoked me to do a lot of research and figure out exactly why it worked,” Shade says. In short, when there’s inflammation and/or toxin build-up in the GI tract, the movement of toxins from the liver and the GI tract ceases, and everything gets shuttled over to the kidneys. Unless you can open up that liver-GI path, you end up overloading your kidney with toxins. Then, if you try to mobilize all that mercury with a chelator, it all hits the kidneys and cause even more damage. So part of the solution is to “clear out” the GI path first. The primary endotoxin binder is charcoal, and clay binds to aflatoxin. Ideally, you’ll want to use a combination of IMD/chlorella, charcoal, and clay to cover all the bases. Quicksilver Scientific is the sole source for IMD. Chlorella, charcoal and clay can be found in most health food stores and grocery stores. “I like a cocktail of GI binders, including a metal-specific one like IMD or chlorella, charcoal (which gets almost all the other mycotoxins, except for aflatoxin), and clay (which gets aflatoxin but not the other mycotoxins). Then you’ve got the pesticides and herbicides. In that mix of different binders, you’re going to be able to get almost all of them. It’s really important in a detox to have a good cocktail of GI binders,” Shade says. Remember, detoxing involves moving the toxin out of the cell; squeezing the toxin out of the cell into your blood circulation, and then filtering out the metals through your kidneys, liver, and GI tract. However, you need to begin by assessing your filtration capacity before you start moving toxins out of your tissues. If you’re feeling awful, it means toxins are building up in circulation faster than they’re being filtered out. Classic herbs known to support healthy liver and kidney function include: dandelion, milk thistle, and bitters like gentian and myrrh. For added kidney support, cranberry (a diuretic), solidago (goldenrod), and corn silk can be used. Shade’s favorite is goldenrod. General kidney and liver support formulas are also viable options. There are several well-known nutraceuticals that help accomplish this. The most well-known and most reliable is lipoic acid. R-lipoic acid is the biologically active form, which is the most useful. Alpha-lipoic acid does work, but that’s a mixture of R-lipoic acid and S-lipoic acid, the latter of which actually works against the process. So R-lipoic acid (sometimes also called R-alpha-lipoic acid) is the one to look for. “R-lipoic acid hits a switch called nuclear factor erythroid 2 (Nrf2). It’s a protein made to translocate into the nucleus. It hits promoter regions on genes. Promoter regions are signals for families of genes to turn on. If you want to accomplish something, there’s usually not just one protein that does it; there’s a family of proteins. There are a number of different nutraceuticals and also pro-oxidants that do that … My favorite is called haritaki or terminalia chebula. It’s an Ayurvedic plant filled with polyphenols … Then you’ve got sulfur compounds from brassicas. Sulforaphane is a well-known one from broccoli seed extract. Erucin comes from all the brassicas. If everything is working well in your body, you can simply use precursors to glutathione, like N-acetylcysteine (NAC) which will support glutathione production. If things aren’t working well, Shade recommends using a direct delivery of glutathione. It’s important to realize that most oral glutathione supplements do not work. It’s simply going to break down to its constituent amino acids, so it’s not an effective intervention. Shade recommends and uses a nanoliposomal glutathione that absorbs under your tongue and is far easier and less expensive than IV glutathione. “Another example of that is the herpes family. Cell cultures of herpes 1, the herpes that you get on your lip, will grow in a petri dish and kill all the cells. If you put glutathione in first, it doesn’t grow at all. If you start it and it starts killing the cells, and you throw glutathione in it, it stops it in its tracks. In fact, liposomes are a topical as well as a systemic. They were originally used in the cosmetic industry. Also, it’s important not to indiscriminately chelate for lead. If you go through the glutathione system upregulation discussed above, you’re not just getting mercury, cadmium, and arsenic out. You’re also getting a whole host of other toxins, including fluorinated, brominated, chlorinated hydrocarbons, pesticides, and herbicides. “Start low, work up, and pulse on and off. That’s the key to making that happen. That will stop the toxic manifestations of lead. But mobilizing lead out of the body using EDTA, DMSA, or 2,3-Dimercapto-1-propanesulfonic acid (DMPS) has to be done with a qualified practitioner. I would say, do the glutathione system upregulation. Get rid of all that other junk. Really build up your body’s own ability to deal with these toxins, and then mobilize the lead. And always do that with a practitioner,” Shade says. To detect heavy metals besides mercury, Shade uses an inductively coupled plasma mass spectrometry (ICP-MS) scan of blood for nutrient and toxic metals. This is important, because you need to have your nutrient metals in order before you can go after toxic metals. Most of the toxic metals displace zinc, and zinc drives many important metabolic reactions. If you have low zinc, you’re not going to be able to detoxify metals well. “You need to bring up the ones that are low, and you need to stop supplementing or stop exposing yourself to the ones that are high. It’s a little bit more complex with copper. But generally, when you get the glutathione system in order and when you get methylation in order, the copper levels will come down. Remember, if you’re detoxing and feeling really unwell, you need to clear more toxins out of your GI tract and blood. When you do that, back off your Nrf2 upregulators, and instead take more GI binders, and more liver and kidney supporting herbs. Drink a lot of water. When you’re feeling clear again, restart the Nrf2 upregulators. Esta entrada se ha publicado en Alimentación, Estudio, Medicina, noticias, Salud y se ha etiquetado como desintoxicación, GI track, glutathion, mercury, metales pesados, neurotoxin. Marca el vínculo permanente.